Today we are presenting to you one of the most amazing finance apps on the Android platform. It is called Bluecoins and it is created by Rammig Software. With this app, you will be able to finally take control of your finances and manage them with an ease. It contains very intuitive workflow, smooth and fast interface and wonderful design. Once you install Bluecoins, you will quickly catch up on using it. The menu features dozens of charts and reports that show you your incomes, expenses and cash flows. Each category allows you to keep track to your assets net worth, liabilities and account balances. Finally, you will be able to record how much you spend and earn (daily, weekly, monthly, quarterly and yearly). Create any type of a transaction, record them and browse them when needed. Every data within this app is secured. 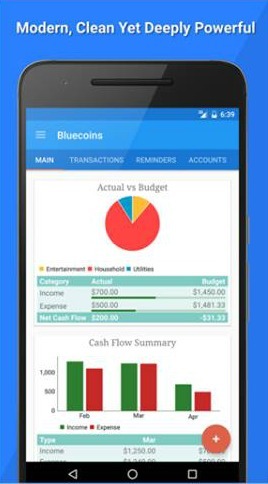 This personal finance manager app can help you to never forget to pay the bills, as well. Just set up a reminder and don't worry about anything, because Bluecoins has got you covered. Download it for free from Google Play.